Days after it was engulfed in toxic gas, the northern Syrian town of Khan Sheikhoun is a place of ghostly desolation, its streets empty and its mourning tents packed with weeping survivors. Here are accounts of survivors. BEIRUT — Three days after it was engulfed in toxic gas, the northern Syrian town of Khan Sheikhoun is a place of ghostly desolation, its streets empty and its mourning tents packed with weeping survivors. More than 80 people were killed in the attack Tuesday on the opposition-held town, a massacre that has been widely blamed on Syrian government forces. Residents and doctors say many of those who fled have yet to return, fearful of lingering fumes or another attack. The dead have been buried in trenches. Here are the accounts of survivors who spoke to The Associated Press about how they are coping. One of the few survivors in a house close to the epicenter of the attack, Fatima Alyousef is haunted by images of her cousin and aunt, who died in her arms as she tried to save them. She broke down as she recounted how she tried to help her aunt, who was gasping for air, to the roof of their two-story house to escape the fumes. When she couldn’t lift her aunt up the stairs, she urged her uncle to come down and help. He too ended up dead, next to his sister. “I tried to lift her, I couldn’t. I am frail,” she said by phone. She took her 17-year-old cousin to the bathroom to splash her with water, but to no avail. She also died in her arms. By the time the attack had ended, 25 members of her extended family were dead. The 24-year-old Alyousef is now staying with a family she hardly knows, away from the contaminated area. She says she still feels ill from the gas, but the town’s only medical facility was destroyed on the day of the attack in a separate airstrike. Alyousef has been left behind before, when her mother and three siblings migrated to Germany through Turkey, braving a perilous crossing by sea. “I sacrificed my life and stayed behind for them to go to Germany because they didn’t have enough money for all of us,” she said, choking back tears. Three days after the attack, Alaa Alyousef’s vision is blurred and he struggles to sleep. He knows he is lucky to have survived, but says he is worried about the long-term impact of the attack. The 27-year-old says his cousin, Abdel Hameed, who lost his wife and 9-month-old twins, suffered a nervous breakdown overnight and is also experiencing vision problems. “His condition is bad, bad,” he said. Alyousef says he is haunted by memories of relatives killed in the attack — their jokes and laughter. His cousins died near the soccer field where they used to play, joke and stay up all night. “Now, it has become a field for our bodies,” he said. Mohammed Abdel Moein was in Bab al-Hawa, a Syrian town on the border with Turkey, when the victims started streaming in, including his Uncle Jalal. “When he came here he couldn’t see. His mind wasn’t all there because of the chemical gas. Thank God he has come to and he’s talking a little,” the 19-year-old said from a hospital in Hatay, in southern Turkey, where he is staying by his uncle’s side. Jalal remembers being shaken out of bed by an explosion that blew out the doors and windows. It had happened many times before, when the government carried out airstrikes, and after years of war residents had grown used to racing down to their underground shelters. “All of a sudden my head started to ache, and I realized that the strike contained a poisonous chemical,” he said. So he ran for the roof instead. As the severity of the attack set in, he realized that even the roof would provide no safety. Relatives came over from next door, and he ordered everyone to get in the car. The surgeon, originally from Khan Sheikhoun but now based in Turkey, raced across the border and headed to his hometown as soon as he received word of the attack. Aircraft were still circling overhead. “It was a ghost town,” he said. The calls for ambulances kept coming in, as paramedics raced to the stricken area to remove bodies from underground shelters or provide aid to people who initially seemed alright but then showed symptoms. A family with six children was brought to him shortly after he arrived. All of them died. “The foam filled their mouths, their eyes were red, and they were bleeding from the nose,” he said, speaking from a town near Khan Sheikhoun. Birds and cats also perished in the attack, he said. He and other doctors and rescue workers have gathered evidence from the site to deliver to international bodies investigating the assault. 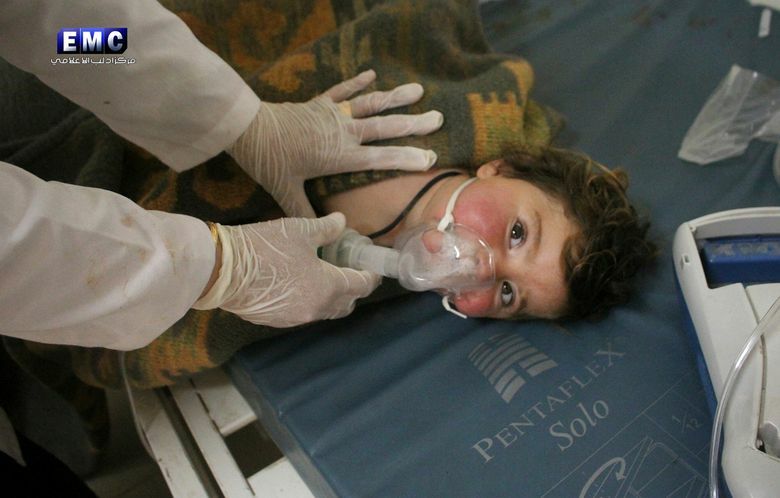 “The killing with chemical gases is not any worse than killing with barrel bombs, or vacuum bombs or killing in detention centers,” said the doctor, who has provided aid in other war-ravaged areas in Syria. “There are many causes of death, but in the end, Syrians are increasingly dying and the international community isn’t caring,” he said. Guzel reported from Hatay, Turkey.